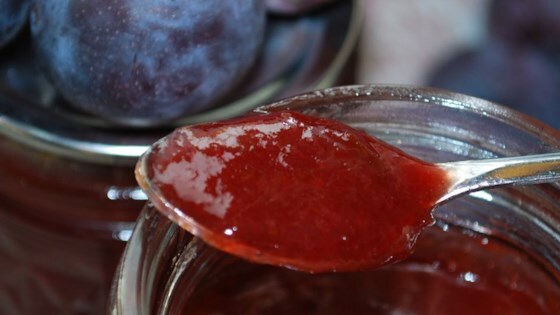 "The Damson plum makes a tart, flavorful, soft-setting jam that is a rich, deep wine-colored spread for cookies, waffles, bread, or anything else, really. Cardamom adds an unusual and subtle perfume to these preserves. Though this recipe does take some time to complete, the majority of the cooking time is hands-off. The best part? You will not need to purchase pectin from the store! Adjust the sugar content to your liking, erring on the side of less sweet, as the jam will cook down considerably. " In a sink full of cool water, rinse and de-stem the plums. Place them in a thick-bottomed pan suitable for slow cooking and deep enough to allow frothing when the plums begin to boil. Add the water and cardamom pods and bring the mixture to a low boil over medium heat. Turn heat to low for a slow simmer and allow the fruit to cook down uncovered for 1 1/2 hours. Allow the plums to cool. To pit the plums, strain the cooled plums with a colander, pressing the juice out with your hands and collecting it in a large bowl. Pick up the pit-and-fruit slurry in the colander by small handfuls and squeeze the plum pulp and skins gently into the bowl with the syrup, retaining the pits in the palm of your hand and then discarding them. Put the plums back into the original pot with the sugar and butter. Cook at a very low simmer until the mixture begins to thicken, about 4 hours. To test for adequate development of pectin, drop a spoonful of the jam on a plate and put it in the refrigerator for a few minutes: the mixture should be soft-set and no longer syrupy. Ladle the hot jam into hot, sterile jars, wipe the rims clean, place sterile lids on, and tighten the screw caps. Allow the jars to cool to room temperature and check to be sure that each jar has sealed. We devoured this jam with leftover plums (not damsom perhaps but a sour variety) and enjoyed it most with queso fresco cheese on toast.